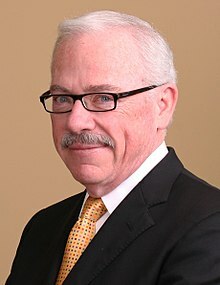 Robert Laurence "Bob" Barr, Jr. (born November 5, 1948) is the Libertarian Party nominee for President of the United States in the 2008 election. He is a former federal prosecutor and a former member of the United States House of Representatives. He represented Georgia's 7th congressional district as a Republican from 1995 to 2003. Barr is known as one of the leaders of the impeachment of President Bill Clinton. Barr joined the Libertarian Party in 2006, and until May 2008[source?] served on its National Committee. ↑ Henneberger, Melinda (1998-05-09). "The Georgia Republican Who Uses the I-Word". New York Times. Retrieved 2008-06-06. ↑ 3.0 3.1 Kurtz, Howard (1999-01-12). "Flynt Calls Rep. Barr a Hypocrite for Divorce Case Answers", Washington Post. Retrieved on 2008-09-13. ↑ 4.0 4.1 Barr, Bob . "Congressman Bob Barr", Profiles in Character: The Values That Made America, Members of the 1994 Class of the United States Congress, Nashville: Thomas Nelson, 1-2. ISBN 0-7852-7356-5. ↑ Meet Jeri Barr Barr '08 - Liberty for America. Barr 2008 Presidential Committee. Retrieved on 2008-05-26. ↑ "Mr. Robert Laurence Barr Jr". Member Directory. State Bar of Georgia. May 2008. Retrieved 2008-05-21. ↑ Libertarian National Committee (2008-05-25). "Libertarian Party selects Bob Barr as 2008 presidential nominee". Press release. http://www.lp.org/media/article_589.shtml. Retrieved 2008-05-25. ↑ 8.0 8.1 8.2 "BARR, Bob - Biographical Information". Biographical Directory of the United States Congress. Congress of the United States. Retrieved 2008-05-21. ↑ "Meet Bob". Barr '08 - Liberty for America. Barr 2008 Presidential Committee. Retrieved 2008-04-20. ↑ Evans, Ben (2006-12-15). "Ex-Rep. Barr Quits GOP for Libertarians". CBS News. Retrieved 2008-05-01. ↑ Libertarian National Committee (2006-12-15). "Former Congressman Bob Barr Accepts Leadership Position within the Libertarian Party". Press release. http://www.lp.org/media/article_447.shtml. Retrieved 2008-04-15. Wikimedia Commons has media related to Bob Barr.